Hundreds of farmers enhanced their know-how on, among others, good floodwater management practices and techniques, by actively participating in knowledge exchange events, targeted trainings and solutions-oriented research activities across Sudan, Kenya, Malawi and Pakistan. Eleven young professionals have been supported to advance their knowledge and skills on varied FBLS relevant thematic areas through engagement in solutions-oriented research (at BSc, MSc and PhD levels), designed to generate useful practical knowledge that contributes to the well-being of society. Several investment proposals have been prepared. Implementation of on-farmer water management practices in Sudan doubled the yield of sorghum while reducing floodwater consumption by 30%. Floodwater harvesting from roads, using deep trenches, has been introduced in Malawi, directly benefiting 85 rural poor households. Creation of a photo story website diving into some of the livelihood changes in the Ayeyarwady delta in Myanmar and lessons on trade-offs between traditional rice crops and new high-yield varieties. AnnualInternational Trainingon Integrated Watershed Management and FBFS in Arid and Semi-Arid Lowlands of the Horn of Africa, held at Mekelle University with 40 participants from Kenya, Somalia and Ethiopia. FBLS mainstreamed into BSc. and MSc. Courses in Sudan, Kenya and Yemen. We would like to thank all our partners for the great collaboration in 2018 and are looking forward continuing this in 2019 and working towards many more joint outputs! From the 4th till the 8th of March, ICRAF, IWMI, FBLN and the Ministry of Agriculture, Livestock, Fisheries and Irrigation and the National Irrigation Board (NIB) are jointly organizing a symposium in Voi, Kenya as a platform for sharing experiences as well as cross-fertilization of knowledge on FBLS. Participation is open to FBLS practitioners across the world. For more information and application details, click here. The deadline for application is the 16th of February. Trees and shrubs in spate irrigation areas have many different uses and considerably contribute to the livelihoods of the people living in these areas. 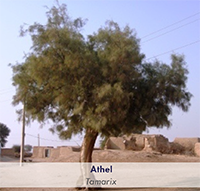 The Tamarix (also called Athel, Frashm Gaz or Lai) tree for example has over 9 uses! Among other uses, the branches are used to divert spate water into the fields and its bark is used in the dying (carpet wool) and tanning industry. Want to know more about the uses of trees and shrubs in spate irrigation areas? Read our new practical note here. Worldwater stormwater management online magazine is an official publication of the stormwater WEF institute. In the new edition, the main findings of research we supported on road runoff harvesting in Kenya has been published: ‘’Road runoff: Kenya captures new source of agricultural water supply’’. There are several other interested topics included related to a.o. flood resilience, coastal flooding, flash floods and green infrastructure to limit flood risks. Read the online magazine here.